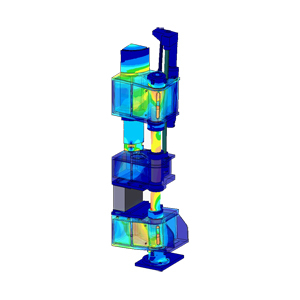 FEA-Solutions (UK) Ltd - Finite Element Analysis For Your Product Design | 545: Hydraulic Press A quarter model and sub-models of a hydraulic press have been subjected to various combinations of dead weight, ram pressure, booster cylinder force and column pre-tension. Transient heat transfer and resulting stresses have been analysed as well. It all confirmed that the refurbished press will be safe for the intended use.